Located in scenic Old Town Fort Collins, Bondi Beach Bar and Grill is here to bring you a little of the Aussie spirit of relaxation and good times. We offer lunch, happy hour, and dinner - and, after the sun goes down, dancing to the best DJ's in Colorado. 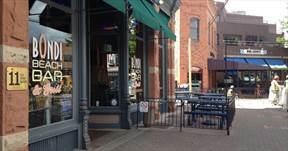 Included are some of the best of Fort Collins' microbrews, including New Belgium & Odell's.